What are the limitations of arthrography? Partial tears of the rotator cuff may not be detected with conventional arthrography. Some joint injuries cannot be detected with conventional (x-ray) arthrography including tears of the cartilage which can be found inside and along the edges of some joints, bruising of neighboring bones and injuries to ligaments outside the joint. MR arthrography images the interior of the joint well, but is not as effective as standard MRI in detecting abnormalities of bone and surrounding tissues. Arthrography is particularly effective for detecting tears or lesions of the structures and ligaments of the joints, especially the knee, wrist and elbow, as well as rotator cuff tears or damage from a shoulder dislocation. X-rays usually have no side effects in the diagnostic range. MRI is a noninvasive imaging technique that does not involve exposure to ionizing radiation. MRI enables the discovery of abnormalities that might be obscured by bone with other imaging methods. The contrast material used in MRI exams is less likely to produce an allergic reaction than the iodine-based contrast materials used for conventional x-rays and CT scanning. Patients who have known allergies to iodine may have an adverse reaction to the contrast material. Because the contrast material is put in a joint and not a vein, allergic reactions are very rare, although in some cases, mild nausea to severe cardiovascular complications may result. If sedation is used there are risks of excessive sedation. The technologist or nurse monitors your vital signs to minimize this risk. There is a very slight risk of an allergic reaction if contrast material is injected. Such reactions usually are mild and easily controlled by medication. If you experience allergic symptoms, a radiologist or other physician will be available for immediate assistance. Nephrogenic systemic fibrosis is currently a recognized, but rare, complication of MRI believed to be caused by the injection of high doses of gadolinium contrast material in patients with very poor kidney function. State-of-the-art x-ray systems have tightly controlled x-ray beams with significant filtration and dose control methods to minimize stray or scatter radiation. This ensures that those parts of a patient’s body not being imaged receive minimal radiation exposure. Follow-up examinations are often necessary, and your doctor will explain the exact reason why another exam is requested. Sometimes a follow-up exam is done because a suspicious or questionable finding needs clarification with additional views or a special imaging technique. A follow-up examination may be necessary so that any change in a known abnormality can be detected over time. Follow-up examinations are sometimes the best way to see if treatment is working or if an abnormality is stable over time. You will experience a slight pinprick and may feel a momentary burning if a local anesthesia is used to numb the joint area. You may feel a fullness as the joint is filled and hear gurgling when the joint is moved. It is normal for the area of your body being imaged to feel slightly warm, but if it bothers you, notify the radiologist or technologist. It is important that you remain perfectly still while the images are being recorded, which is typically only a few seconds to a few minutes at a time. For some types of exams, you may be asked to hold your breath. You will know when images are being recorded because you will hear tapping or thumping sounds when the coils that generate the radiofrequency pulses are activated. You will be able to relax between imaging sequences, but will be asked to maintain your position without movement as much as possible. You will usually be alone in the exam room during the MRI procedure. However, the technologist will be able to see, hear and speak with you at all times using a two-way intercom. Many MRI centers allow a friend or parent to stay in the room as long as they are also screened for safety in the magnetic environment. You may be offered or you may request earplugs to reduce the noise of the MRI scanner, which produces loud thumping and humming noises during imaging. Children will be given appropriately sized earplugs or headphones during the exam. MRI scanners are air-conditioned and well-lit. Some scanners have music to help you pass the time. When the contrast material is injected, it is normal to feel coolness and a flushing sensation for a minute or two. The intravenous needle may cause you some discomfort when it is inserted and once it is removed, you may experience some bruising. There is also a very small chance of irritation of your skin at the site of the IV tube insertion. Some patients may sense a metallic taste in their mouth after the contrast injection. If you have not been sedated, no recovery period is necessary. You may resume your usual activities and normal diet immediately after the exam. A few patients experience side effects from the contrast material, including nausea and local pain. Very rarely, patients are allergic to the contrast material and experience hives, itchy eyes or other reactions. If you experience allergic symptoms, notify the technologist. A radiologist or other physician will be available for immediate assistance. If you experience allergic symptoms, a radiologist or other physician will be available for immediate assistance. After the examination, you may experience swelling and discomfort. You may apply ice to the joint to reduce swelling if it is bothersome. A mild over-the-counter analgesic can be taken for pain. These symptoms usually disappear after 48 hours. Contact your doctor if they persist after two days. Vigorous exercise is not recommended for 12 hours after the exam. 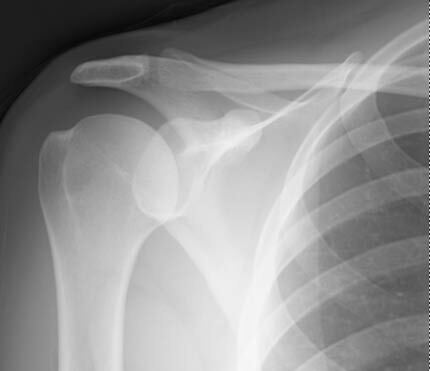 Iodine contrast material has been injected into the shoulder joint - this is a shoulder arthrogram. The patient is positioned on the examination table and x-rays are taken of the joint to be compared later with the arthrograms. If recent x-rays are available, the physician may choose to use these for reference. Next, the skin around the joint is cleansed with antiseptic and a local anesthetic is injected into the area. Your physician will numb the area with a local anesthetic. The area where the needle is to be inserted will be sterilized and covered with a surgical drape. A needle is then inserted into the joint. The radiologist, a physician specifically trained to supervise and interpret radiology examinations, will use a syringe to drain the joint fluid, which may be sent to a laboratory for analysis. Aspiration is typically performed when an infection is suspected. The contrast material and sometimes air are injected into the joint space and the needle is removed. Air will not be used if the patient is undergoing MR arthrography. The patient will be asked to move the affected joint to distribute the contrast material throughout the space. The conventional arthrography exam is usually completed within 30 minutes. Exams involving MRI may take more than one hour. 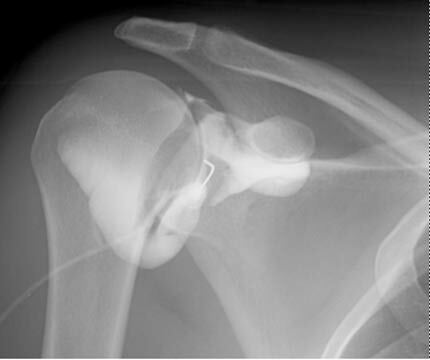 An x-ray of the right shoulder prior to injection of contrast material. X-rays are a form of radiation like light or radio waves. X-rays pass through most objects, including the body. Once it is carefully aimed at the part of the body being examined, an x-ray machine produces a small burst of radiation that passes through the body, recording an image on photographic film or a special digital image recording plate. Different parts of the body absorb the x-rays in varying degrees. Dense bone absorbs much of the radiation while soft tissue, such as muscle, fat and organs, allow more of the x-rays to pass through them. As a result, bones appear white on the x-ray, soft tissue shows up in shades of gray and air appears black. Until recently, x-ray images were maintained as hard film copy (much like a photographic negative). Today, most images are digital files that are stored electronically. These stored images are easily accessible and are frequently compared to current x-ray images for diagnosis and disease management. Fluoroscopy uses a continuous or pulsed x-ray beam to create a sequence of images that are projected onto a fluorescent screen, or television-like monitor. When used with a contrast material, which clearly defines the area being examined by making it appear bright white, this special x-ray technique makes it possible for the physician to view joints or internal organs in motion. Still images are also captured and stored either on film or electronically on a computer. Unlike conventional x-ray examinations and computed tomography (CT) scans, MRI does not depend on ionizing radiation. Instead, while in the magnet, radio waves redirect the axes of spinning protons, which are the nuclei of hydrogen atoms, in a strong magnetic field. The magnetic field is produced by passing an electric current through wire coils in most MRI units. Other coils, located in the machine and in some cases, placed around the part of the body being imaged, send and receive radio waves, producing signals that are detected by the coils. A computer then processes the signals and generates a series of images each of which shows a thin slice of the body. The images can then be studied from different angles by the interpreting radiologist. Frequently, the differentiation of abnormal (diseased) tissue from normal tissues is better with MRI than with other imaging modalities such as x-ray, CT and ultrasound. The equipment typically used for this examination consists of a radiographic table, an x-ray tube and a television-like monitor that is located in the examining room. Fluoroscopy, which converts x-rays into video images, is used to watch and guide progress of the procedure. 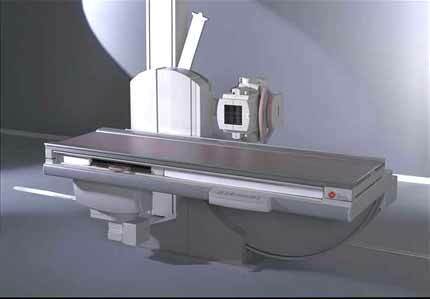 The video is produced by the x-ray machine and an image intensifier that is suspended over a table on which the patient lies. The traditional MRI unit is a large cylinder-shaped tube surrounded by a circular magnet. You will lie on a moveable examination table that slides into the center of the magnet. Some MRI units, called short-bore systems, are designed so that the magnet does not completely surround you; others are open on the sides (open MRI). These units are especially helpful for examining patients who are fearful of being in a closed space and for those who are very obese. Newer open MRI units provide very high quality images for many types of exams; however, open MRI units with older magnets may not provide this same image quality. Certain types of exams cannot be performed using open MRI. For more information, consult your radiologist. The computer workstation that processes the imaging information is located in a separate room from the scanner. Other equipment necessary for performing arthrography include a variety of needles, syringes and a water-soluble contrast material. No special preparation is necessary before arthrography. Food and fluid intake do not need to be restricted, unless a sedative will be given. You should inform your physician of any medications you are taking and if you have any kidney problems or allergies, especially to iodinated contrast materials. Also inform your doctor about recent illnesses or other medical conditions. Some MRI examinations may require the patient to receive an injection of contrast into the bloodstream. The radiologist or technologist may ask if you have allergies of any kind, such as allergy to iodine or x-ray contrast material, drugs, food, the environment, or asthma. However, the contrast material used for an MRI exam, called gadolinium, does not contain iodine and is less likely to cause side effects or an allergic reaction. The radiologist should also know if you have any serious health problems or if you have recently had surgery. Some conditions, such as severe kidney disease, may prevent you from being given contrast material for having an MRI. If you are scheduled to have MR or CT arthrography and have claustrophobia (fear of enclosed spaces) or anxiety, you may want to ask your physician about being sedated prior to the scheduled examination. jewelry, watches, credit cards and hearing aids, all of which can be damaged. pins, hairpins, metal zippers and similar metallic items, which can distort MRI images. In general, metal objects used in orthopedic surgery pose no risk during MRI. However, a recently placed artificial joint may require the use of another imaging procedure. If there is any question of their presence, an x-ray may be taken to detect the presence of and identify any metal objects. Patients who might have metal objects in certain parts of their bodies may also require an x-ray prior to an MRI. You should notify the technologist or radiologist of any shrapnel, bullets, or other pieces of metal which may be present in your body due to accidents. Dyes used in tattoos may contain iron and could heat up during MRI, but this is rarely a problem. Tooth fillings and braces usually are not affected by the magnetic field but they may distort images of the facial area or brain, so the radiologist should be aware of them. You may be asked to remove some or all of your clothes and to wear a gown during the exam. You may also be asked to remove jewelry, removable dental appliances, eye glasses and any metal objects or clothing that might interfere with the x-ray images. Though MRI does not use ionizing radiation, women should still inform their physician and technologist if they may be pregnant. Children younger than teenagers may need to be sedated in order to hold still for the procedure. Parents should ask about this beforehand and be made aware of food and drink restrictions that may be needed prior to sedation. Arthrographic images help physicians evaluate alterations in structure and function of a joint and help to determine the possible need for treatment, including arthroscopy, open surgery or joint replacement. Arthrography is medical imaging to evaluate conditions of joints. There are several methods to do this. Conventional arthrography is the x-ray examination of a joint that uses a special form of x-ray called fluoroscopy and a contrast material containing iodine. Alternate methods of arthrography examinations use magnetic resonance imaging (MRI) or computed tomography (CT). Fluoroscopy makes it possible to see bones, joints and internal organs in motion. When iodine contrast is injected into the joint, it fills the entire joint and appears bright white on an arthrogram, allowing the radiologist to assess the anatomy and function of the joint. Although the injection is typically monitored by fluoroscopy, the examination also involves taking radiographs for documentation. The images are most often, but not always, stored or viewed electronically. MR arthrography also involves the injection of a contrast material into the joint, just like in conventional arthrography, except that the MR contrast material is different and contains gadolinium, which affects the local magnetic field. As in conventional arthrography, the contrast material outlines the structures within the joint and allows them to be evaluated by the radiologist. MRI uses a powerful magnetic field, radiofrequency pulses and a computer to produce detailed pictures of organs, soft tissues, bone and virtually all other internal body structures. The images can then be examined on a computer monitor, printed or copied to CD. MRI does not use ionizing radiation (x-rays). CT arthrography uses the same type of contrast material as conventional arthrography and may be supplemented by air to produce a double contrast CT arthrogram. CT makes cross sectional images processed by a computer using x rays. Surgery may be an option to restore joint mobility and repair damaged joints. In worst-case scenarios, total artificial joint replacement may be needed. Is Surgery an Option for Rheumatoid Arthritis? Surgery may be recommended to restore joint mobility or repair damaged joints. Doctors who specialize in joint surgery are orthopedic surgeons. The types of joint surgery range from arthroscopy (insertion of a tubelike instrument into the joint to see and repair abnormal tissues) to partial and complete replacement of the joint. 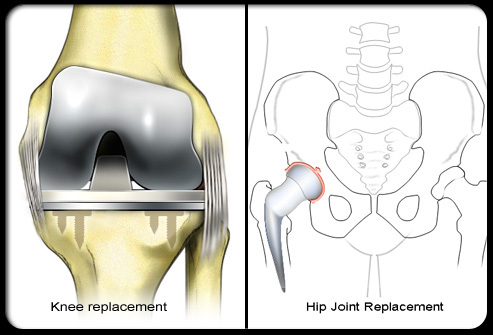 Total joint replacement is a surgical procedure whereby a destroyed joint is replaced with artificial materials. For example, the small joints of the hand can be replaced with plastic material. Large joints, such as the hips or knees, are replaced with metals. What Medications Are Used to Treat Rheumatoid Arthritis? Two classes of medications are used in treating rheumatoid arthritis: fast-acting “first-line drugs” and slow-acting “second-line drugs” (also referred to as disease-modifying antirheumatic drugs or DMARDs). The first-line drugs, such as aspirin and cortisone (corticosteroids), are used to reduce pain and inflammation. 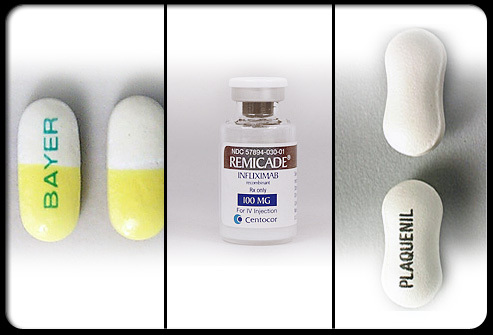 The slow-acting second-line drugs, such as methotrexate (Rheumatrex, Trexall), and hydroxychloroquine (Plaquenil), promote disease remission and prevent progressive joint destruction, but they are not anti-inflammatory agents. Some newer “second-line” drugs for the treatment of rheumatoid arthritis include leflunomide (Arava) and the “biologic” medications etanercept (Enbrel), infliximab (Remicade), anakinra (Kineret), adalimumab (Humira), rituximab (Rituxan), and abatacept (Orencia). There is no known cure for rheumatoid arthritis; however, early medical intervention has been shown to be important in improving outcomes. There is no known cure for rheumatoid arthritis. To date, the goal of treatment in rheumatoid arthritis is to reduce joint inflammation and pain, maximize joint function, and prevent joint destruction and deformity. Early medical intervention has been shown to be important in improving outcomes. Aggressive management can improve function, stop damage to joints as seen on X-rays, and prevent work disability. Optimal treatment for the disease involves a combination of medications, rest, joint-strengthening exercises, joint protection, and patient (and family) education. Treatment is customized according to many factors such as disease activity, types of joints involved, general health, age, and patient occupation. Treatment is most successful when there is close cooperation between the doctor, patient, and family members. In arthrocentesis, a sterile needle and syringe are used to drain joint fluid out of the joint for study in the laboratory. The doctor may elect to perform an office procedure called arthrocentesis. 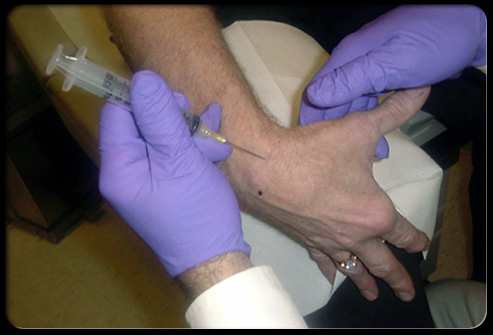 In this procedure, a sterile needle and syringe are used to drain fluid out of the joint for study in the laboratory. Analysis of the joint fluid can help to exclude other causes of arthritis, such as infection and gout. Arthrocentesis can also be helpful in relieving joint swelling and pain. Occasionally, cortisone medications are injected into the joint during the arthrocentesis in order to rapidly relieve joint inflammation and further reduce symptoms. 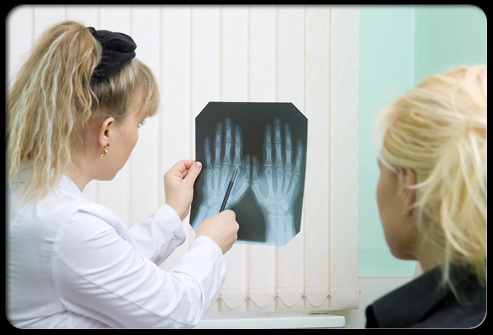 Joint X-rays can also be helpful in monitoring the progression of rheumatoid disease and joint damage over time. Joint X-rays may be normal or only show swelling of soft tissues early in the disease. 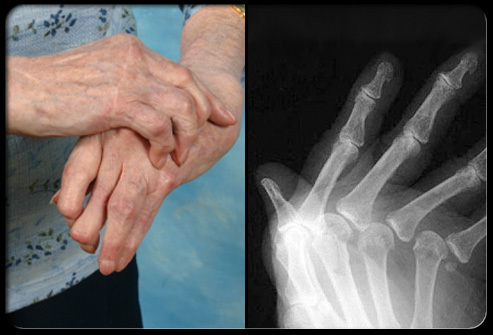 As the disease progresses, X-rays can show bony erosions typical of rheumatoid arthritis in the joints. Joint X-rays can also be helpful in monitoring the progression of disease and joint damage over time. Bone scanning, a radioactive test procedure, and MRI scanning can demonstrate inflamed or eroded joints. 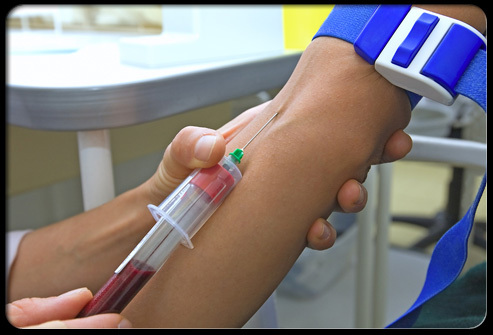 The sedimentation rate (sed rate), another blood test for RA, is a measure of how fast red blood cells fall to the bottom of a test tube. 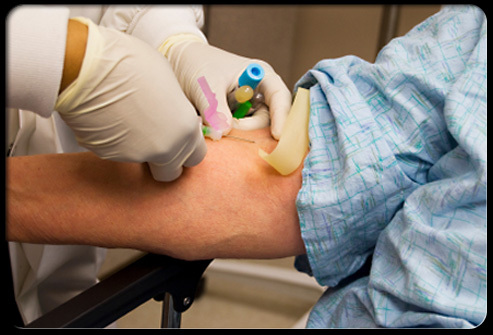 A newer, more specific blood test for rheumatoid arthritis is the citrulline antibody test. Abnormal blood antibodies can be found in patients with rheumatoid arthritis. A blood antibody called “rheumatoid factor” can be found in 80% of patients. Citrulline antibody is present in most patients with rheumatoid arthritis. It is useful in the diagnosis of rheumatoid arthritis when evaluating patients with unexplained joint inflammation. A test for citrulline antibodies is most helpful in detecting the cause of previously undiagnosed inflammatory arthritis when the traditional blood test for rheumatoid arthritis, rheumatoid factor, is not present. Citrulline antibodies are also indicators of potentially more aggressive disease. Citrulline antibodies have been felt to represent the earlier stages of rheumatoid arthritis in this setting. Another antibody called “the antinuclear antibody” (ANA) is also frequently found in patients with rheumatoid arthritis. The first step in the diagnosis of rheumatoid arthritis is a meeting between the doctor and the patient. 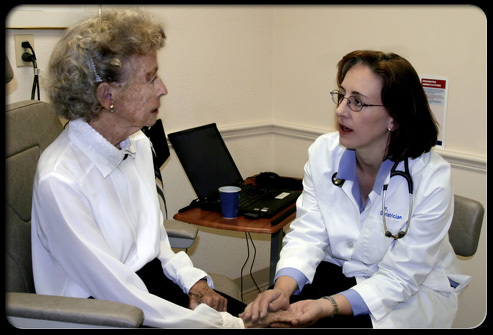 The first step in the diagnosis of rheumatoid arthritis is a meeting between the doctor and patient. 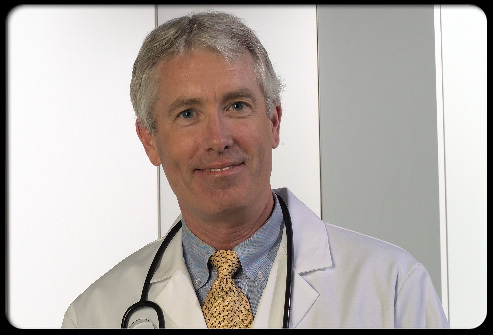 A doctor with special training in arthritis and related diseases is called a rheumatologist. The doctor reviews the history of symptoms, examines the joints for inflammation and deformity, the skin for rheumatoid nodules, and other parts of the body for inflammation. Certain blood and X-ray tests are often obtained. The diagnosis will be based on the pattern of symptoms, the distribution of the inflamed joints, and the blood and X-ray findings. Several visits may be necessary before the doctor can be certain of the diagnosis. The distribution of joint inflammation is important to the doctor in making a diagnosis. In rheumatoid arthritis, the small joints of the hands, wrists, feet, and knees are typically inflamed in a symmetrical distribution (affecting both sides of the body). When only one or two joints are inflamed, the diagnosis of rheumatoid arthritis becomes more difficult. The doctor may then perform other tests which ‘are described on the next slides. A rheumatologist is a medical doctor who specializes in the nonsurgical treatment of rheumatic illnesses, especially arthritis. A rheumatologist is a medical doctor who specializes in the nonsurgical treatment of rheumatic illnesses, especially arthritis. Rheumatologists have special interests in unexplained rash, fever, arthritis, anemia, weakness, weight loss, fatigue, joint or muscle pain, autoimmune disease, and anorexia. They often serve as consultants, acting like detectives for other doctors. Rheumatologists have particular skills in the evaluation of the over 100 forms of arthritis and have special interest in rheumatoid arthritis, spondylitis, psoriatic arthritis, systemic lupus erythematosus, antiphospholipid syndrome, Still disease, dermatomyositis, Sjogren’s syndrome, vasculitis, scleroderma, mixed connective tissue disease, sarcoidosis, Lyme disease, osteomyelitis, osteoarthritis, back pain, gout, pseudogout, relapsing polychondritis, Henoch-Schonlein purpura, serum sickness, reactive arthritis, Kawasaki disease, fibromyalgia, erythromelalgia, Raynaud’s disease, growing pains, iritis, osteoporosis, reflex sympathetic dystrophy, and others.